ePass Karnataka 2018 Fresh/ Renewal Scholarship Application Form Apply Online: Karnataka ePass offers financial aid for students who wish to continue the education. Karepass application process will be starting soon. Eligible aspirants can apply for Karnataka ePass to get the financial support from the state government. Aspirants can continue their education in Degree and other professional courses by availing of this financial aid. Candidates obtaining the education in the state of Karnataka can check the Karnataka ePass online application process, eligibility criteria, and other details from the following article. Karnataka state yearly offers the financial assistance for students to continue their education. The state is intended to promote the education rate in the state by supporting the students. 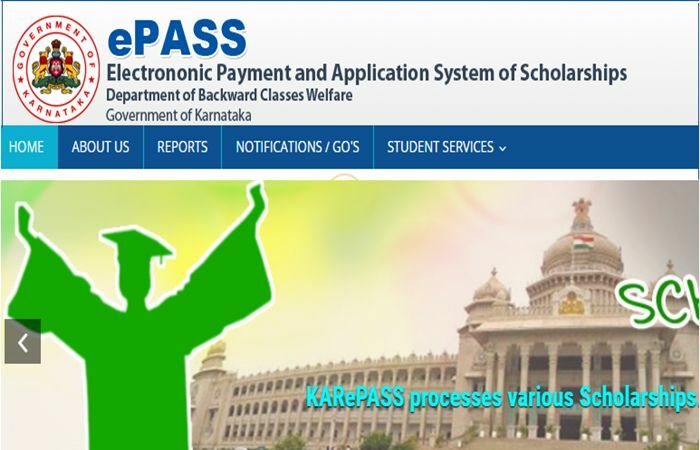 State Government of Karnataka has introduced the Karnataka ePass scholarship system to encourage the students. The scholarship is accessible for students who are pursuing the post-matric and pre-matric courses in the state. The Government of Karnataka, Social Welfare offers the post-matric scholarship for the students undergoing their post-matric courses like Graduate Degree and other professional degree courses. Under the Karnataka ePass, students belong to Backward classes SC/ST and others can avail the scholarships. Students who are eligible to apply for Karnataka education scholarships can apply through online. Various schools, colleges will be associated with Karnataka ePass scholarship scheme. Students undergoing education under the universities can also avail the benefits of ePass Scholarships. Who Can Apply for Karnataka ePass Scholarship 2018? Karnataka State Welfare Society is going to offer the scholarships for eligible aspirants. Under the ePass scholarship scheme, students who are obtaining the post-matric education such as B.Sc, BA, B.Com, BE/B.Tech or other courses can apply for Karepass aid. The terms and conditions to apply for Karnataka ePass scholarship are as follows. Student’s parental annual income must not exceed Rs. 2,00,000/- per year. Candidates preferably must belong to Schedule Caste or Schedule Tribe (SC/ST). Students must have at least 75% of attendance. Candidates obtaining Post-matric course in the state of Karnataka are eligible to apply for ePass Scholarship. The only online application process is supported. Through their colleges, candidates can apply for the scholarship before 1 week of the online application date. Student’s Aadhar Card must be linked with Bank account’s Direct Benefit Transfer (DBT). Students applying for Karnataka EPass Scholarship must have some required documents. Students can check the details of required documents from the following article. Bonafide certificate from the prospective college of the candidate and the SSLC certificate. Candidates having the suitable eligibility to apply for Karnataka ePass. While filling up the Karnataka ePass online application, students must aware of filling. Remember to fill the application form without any mistakes. It is not possible to correct the mistakes once after applying. So, fill the Karepass online application form without mistakes. Recheck twice after filling up the application form. Steps to apply for Karnataka epass scholarship are as follows. click here below link. 2018-19 FRESH Registrations (Phase 3) are Now Open for HOSTEL Applications (GENERAL/MODEL Hostels) – All Courses. Initially, visit the Karnataka Welfare Society’s official website @ karepass.cgg.gov.in. On the homepage, Epass application link will be visible. Click on the link saying “Apply Online”. Fill up the epass application with all required details (details as per SSLC certificate). Upload the scanned copies of required documents carefully and click on submit button once you are done. Now take a printout of the ePass Karnataka Application form and submit it in your colleges within 7 days. Students can check the ePass application status after the successful application process. If any mistakes did during the application process, the application will be rejected. So, students can track the Karepass status from the official website, karepass.cgg.gov.in. the relevant link to track the Karnataka epass status will be provided on the official portal. Sir/Madam, my application has been rejected due to incorrect aadhar number by Taluk officer. How can I rectify my mistake? And as per my knowledge all d details I entered were correct. My Aadhar card no. was updated incorrectly and so the application was rejected. How can I correct this mistake of mine? Mine income and cast certificate is expired and now it is ready. Sir now scholarship is open for applying for OBC scholarship 2nd puck? I have not applied it ,becoz my income certificate was expired,now i got it,please will u people leave this form again ,plzz plzz plzz.becoz itz too important.